Gears of War 2 was of course playable only in multiplayer mode at the MGS, so here is a video of that mode. That's actually pretty disappointing, hopefully the other levels look nicer. The new minigun looks pretty cool though. meh.. cant say i'm too impressed with multiplayer. I had hoped everything would of been destructable, or atleast a noticable graphical upgrade. I think horde will be where its at for me. If you go read the MP previews out there, you will hear from thoes that have played the game that allot has changed, but of course the kickass core gameplay remains. i played like 2 hours of gow 2 multiplayer in digiexpo (finland) and all the new Maps, Weapons and Gameplay mechanics are great. so far everything seems perfect and i cant wait to play full version in 1 week. This MP looks so much better than Gears of War. They've fixed what needed to be fixed and I can't ask for more than that. Epic had a difficult task - how do you improve on something that has a great base in just 2 years? Somehow they've pulled it off. I'm a big Gears fan from a multiplayer perspective but I pray to the gaming Gods that Epic will SUPPORT THEIR GAME THIS TIME! I mean, they totally abandoned Gears 1 and ALL the glitches remained unfixed. Well, all but falling into the map randomly, but the rest REAL game killing glitches remained. I dont trust them to do any better this time, it'll take the NEXT TWO YEARS to convince me otherwise. I'm only missing the Unconceivable... achievement from gears 1, thats how much I loved it, and had to suffer countless hours of glitcher and host torment. If you think you know host shotty, try playing against americans across the pond late at night cause no euro people are playing the damn game. In fact, the best thing about Gears 2 might be that I get to play with somebody from Europe again. YAY! host advantage still as strong as ever? so i wouldnt say the didnt support the game, maybe you should have played Player matches which are more focused on fun rather then winning so there is hardly any glitchers ;) at the end of the day dont you play a game to have fun? Looks like the best multiplayer shooter along with Call of Duty 4. 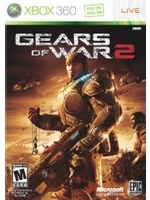 Everyone whos hating on the Gears multiplayer hasn't played long enough to understand and enjoy its strengths. I stopped about a year ago because of its weakenesses ( overpowered sniper rifle & shotgun, glitch/cheaters & weak lobby system ) but it looks like all of its been fixed for Gears 2. Game on ! There's no way this is accurate. I plan on playing this thing quite a bit, but I find it hard to believe there's no host advantage. This is an overplayed issue in Gears of War as it stands, but the truth is that there's a noticeable host advantage in most peer-to-peer games. It often dictates the winner in a Halo 3 fight that comes down to a melee, etc. They may have beefed up their net code dramatically.. perhaps to the point that most people won't notice.. but when you're hosting the game server off of one of the players boxes they are bound to see some sort of advantage. Gears of War multiplayer was always underrated, and this issue was always overstated though, so I'm not the least bit worried about it. I wonder when MS will wake up and start supporting dedicated servers aswell.. You simply cannot have 1 player be the server and have a fair game, no matter what netcode tricks they put in (usually a fat buffer in detection time to compensate the latency advantage of the host).. It's one of the reasons why competitive gaming on Xbox Live cannot be taken to seriously..
All MS needs to do is allow dedicated serversoftware to be run on a Xbox 360 (or even PC), just like they did on the 1st Xbox.. I never understood why they removed that feature with the Xbox 360.. I think MS thought it wasn't important enough.. Peer to peer gaming is probably the most secure and cheapest option for them, and aslong as the masses are ok with it, why bother? Correct, from the previews i gather that it is much less noticeable this time round, but it still exists. P2P gaming is ofcourse a good cheaper option for Microsoft..and theres nothing wrong with it in theory. The trouble starts when the americans get on and start dominating the hosting. Ofcourse Microsoft could easily fix all this by adding optional region filters as standard to all 360 games.. i'm sure you've taken note on how you have all 5 green bars lit on your ping on cod4 when its hosted inside your country...and how it drops to 3 when hosted from the states. Ofcourse Microsoft have yet to do this simply because we're not important enough for them to listen to. There are dedicated servers on the 360, most noticably EA games. Plus Epic has already gone on record to say that gears 2 will have dedicated servers..hence the "no host advantage". Although i believe this will just be for ranked games? Anyway, theres plenty of negatives with dedicated servers also.. teething problems with new games being one (look at the ps3's history). And if a dedicated server goes down, or gets hit with lag, then you have to suffer it and wait it out. Benefit of p2p is that your options of getting a new hosted game is endless. Also dedicated servers on consoles eventually get pulled..rendering your online portion of an older game worthless. I'm pretty sure EA games have their own match making servers, not dedicated servers. I'd like to see a source for this claim that Gears 2 has dedicated servers, as stated by Epic. That's news to me. Dedicated servers also don't have to be hosted by the companies themselves--many Xbox 1 games allowed you to run a dedicated server off of another Xbox--and if developers were allowed to make Windows and Linux servers available for their games, they could easily be hosted by third parties. How do you think we do this on the PC? Activision, EA, etc.. they don't host our servers. I can't wait to HEAR what that avalanche sounds like! There will still be host advantage, but it's been toned down significantly. Oh dear, you're quite argumentitive today arent you? I'm well aware on how dedicated servers work. They have outside sponsors in the form of advertising.. this is why pc online gaming remains free, and why theres no reason ps3 gaming shouldnt also. EA however do have dedicated servers placed for the majority of their games on console. Battle field the latest example. "their own match making" implys that its still being hosted by p2p. Which is not the case. Plus i said EA "games" have dedicated servers on the 360..not EA host the games. There are other games on the 360 with dedicated servers..EA's was just the easiest example. Frontlines is another.. which is why the 360's had 50player gaming for over the last year. I'm not so much argumentative, I just like it when people get their facts straight. I'm well aware on how dedicated servers work. They have outside sponsors in the form of advertising..
...apparently not! Advertising doesn't drive the majority of the dedicated server economy. People rent servers from hosts, mostly to form a home for their community or clan (or just because they like providing that service, or like being server admins). Most Call of Duty servers, for example, are owned by clans or individuals, and are not payed for by advertising at all. This is the case in most PC games. Additionally, hosts provide their own set of dedicated servers, because it helps sell that service to those who might rent additional server space. Some are sponsored, this is true, but it's hardly the driving force behind PC gaming. This is why PC gaming remains free? No--that's because there's no single entity controlling PC gaming. Sony has decided to keep PSN free as well, despite running a horde of match making servers, which for the most part deliver a P2P gaming experience almost identical to Xbox Live. It has very little to do with advertising. Most EA games do not use dedicated servers, they all use EA's match making servers. This was part of EA's conditions to get them on Xbox Live in the first place. There are very, very few games on Xbox Live that use dedicated servers. The last sentence in your paragraph there doesn't even make sense. EA has dedicated servers--but EA doesn't host the games? Wut? I'm well aware that FFOW has dedicated servers. Bad Company and FFOW are part of the exception, hardly the rule. I believe you're just plain wrong in your claim that EA uses dedicated servers for most of their games. There's absolutely no data I can find to back that up. And again--where is this source that claims that Gears of War 2 will have dedicated servers? I'd love to see it. I'm not saying you're wrong, but this is the first I've heard of it, and I'd love to see the evidence to back up such a statement. There are multiple threads on Epic's own forums that seem to suggest otherwise.